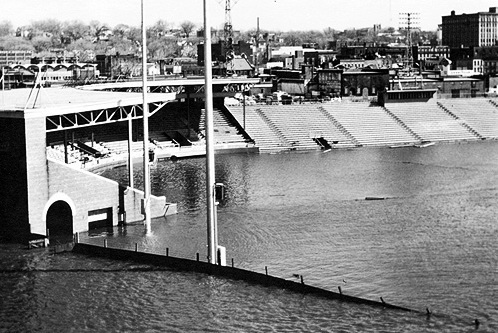 The torrential rain that fell throughout the Midwest last week not only cancelled or postponed a lot of Midwest League games — it left a lot of water standing in its wake. 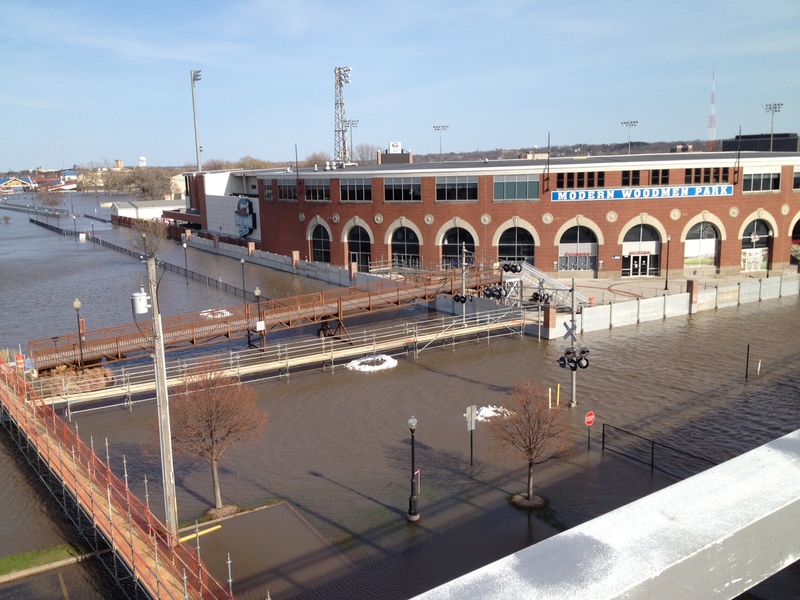 Damaging floods are a problem in a lot of places, including Davenport, Iowa, where the Quad Cities River Bandits play their home games — though Modern Woodmen Park remains dry despite being surrounded by the Mississippi River. In the next photo, you can see the temporary walkway that was built to allow access to the ballpark. 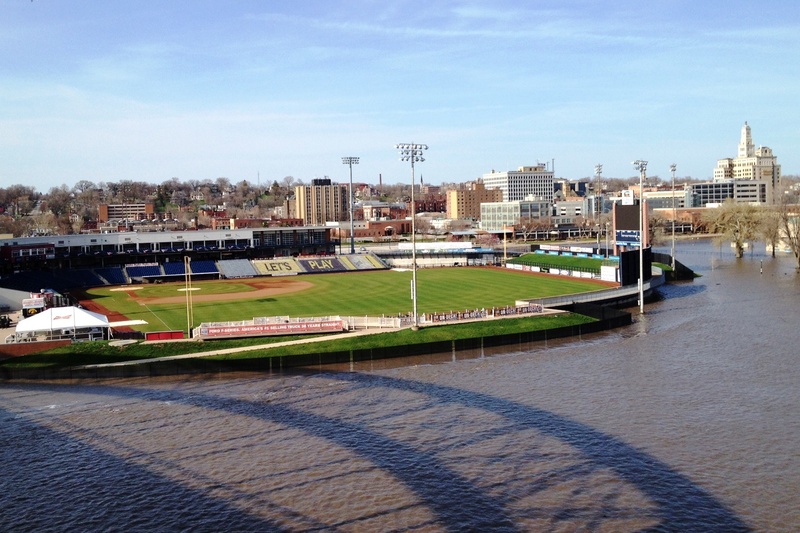 The River Bandits’ next home game is scheduled for Thursday night, and I’m seriously considering going to that game just so I can use the temporary walkway. The Mississippi River began to retreat today, but there is another significant bout of rain forecast for tomorrow. Although the games will go on, plans to erect a Ferris wheel outside the ballpark will not — at least they won’t this year. As I wrote in this previous post, the Ferris wheel was supposed to be delivered and installed in June, but construction can’t begin until the river recedes and the ground is completely dry. Now it is expected to be installed during the offseason in preparation for the start of the 2014 season. Six years later, Municipal Stadium was renamed John O’Donnell Stadium in honor of a longtime sports editor from the area. 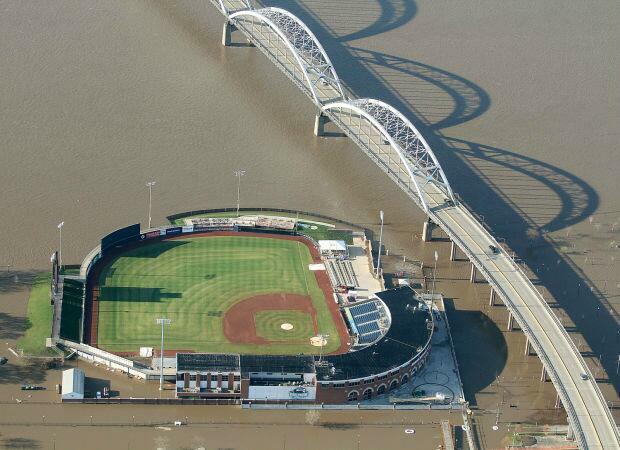 The stadium took on the name Modern Woodmen Park when naming rights to the ballpark were sold in December 2007.